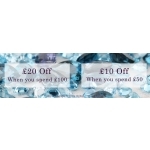 The Gemondo Jewellery Promotion is on, £20 off when you spend £100, £10 off when you spend £500. Free UK delivery and returns. The promotion is valid online until 4 November 2018.